Holiday leftovers don’t last long in our homes. Especially the Very Tasty Turkey Salad. (Chicken works well, too.) The trick is starting with a well-seasoned turkey. Stacey’s husband is from the island of Puerto Rico and taught us to make “pavochon,” a turkey seasoned Puerto Rican style that consists of ground garlic cloves, Sazón spices, salt, and extra virgin olive oil. Grind those ingredients with a mortar and pestle, cut slits in the bird and rub the seasoning under the skin, atop the skin and inside the cuts. Let that sit for a day or two before slow roasting the bird in a self-basting turkey oven bag. The key here is LOW and SLOW. Take leftover pieces of the bird and rip them apart or chop. To taste, add a bit at a time of the following: Dijon mustard, mayonnaise, chopped scallions, a sliced hard-cooked egg or two, diced tomatoes, pepper and salt. 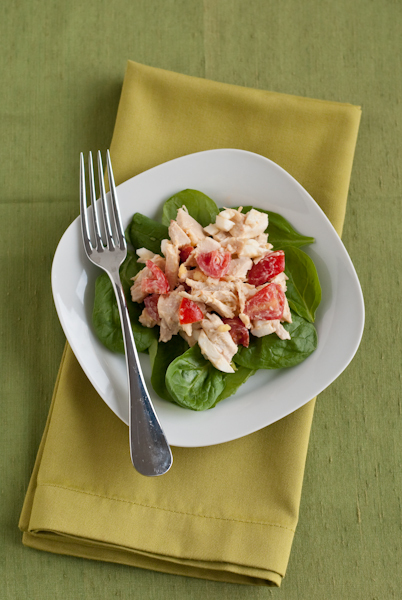 There are no rules with Turkey Salad; get creative! What are you doing with your leftovers? Please share your ideas with other readers! How Stacey Got the Shot: On the dining room table with natural light and foam core set up to bounce light onto the subject and fill in shadows. ISO 100, focal length 50mm, f/4, 1/100 second exposure.